The SG-1000 home console was only one part of Sega’s multifaceted strategy to reach consumers beyond the arcades. 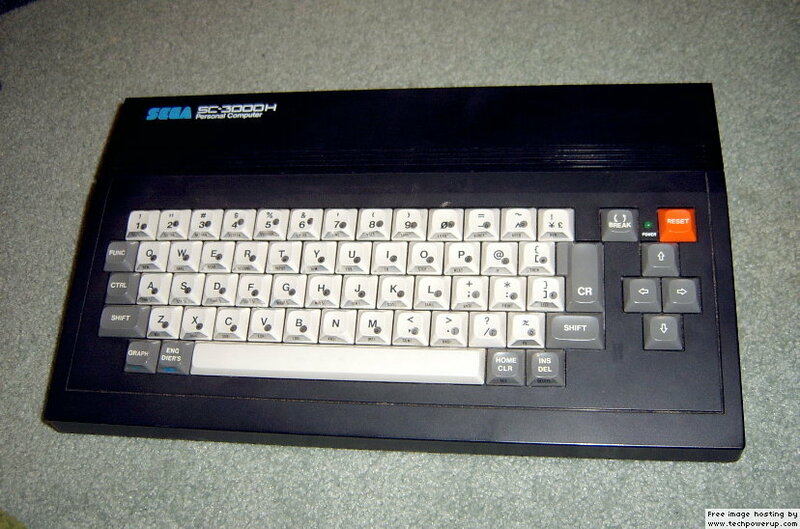 The SC-3000, for example, was Sega’s lone entry into the home computer market and was released in tandem with the SG-1000 on July 1983. Sega’s computer was comprised of similar hardware to the SG-1000, but came with a keyboard and support for hardware expansions instead of crappy joysticks. The majority of the SG-1000’s catalog is playable on the SC-3000, while the reverse is also true if one has an SK-1100 keyboard add-on for the SG-1000. The SC-3000 has a substantial amount of exclusive software as well, but a good portion of it is either educational or business-related; fitting, given that the SC-3000 wasn’t intended to be a game machine. Like the SG-1000, the SC-3000’s distribution was limited to Japan, Australia/New Zealand and select European countries. While neither system became the respective industry standard – in or out of Japan – the SC-3000 sold better than the SG-1000 and continues to be highly regarded among collectors. The SC-3000 atop carpet. Thanks be to TechPowerUp.com for use of this photo. Sega debuted the SC-3000 with the intent of allowing other computer manufacturers to utilize their hardware. The goal, according to SegaRetro, was to produce a worldwide standard line of computers with Sega hardware, but for any number of valid reasons – lack of sales, limited reach, popularity of other computers – only a few off-brands were produced. Cheers to SegaRetro.org for this spanking photo of the Multivision! 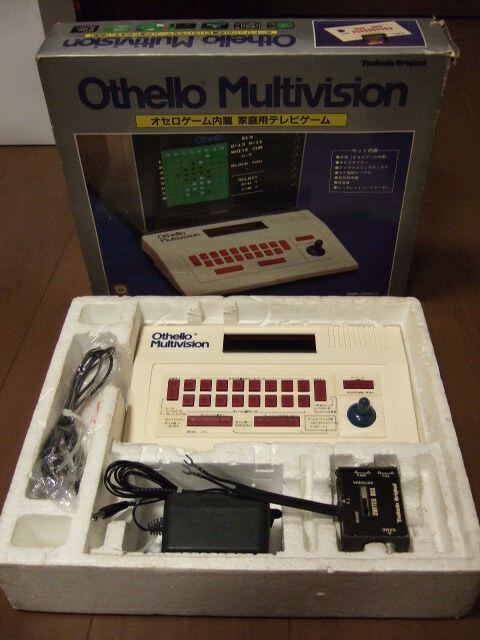 The Othello Multivision FG-1000 developed by Tsukuda Original was one of the more well-known SC-3000 clones. As you can see, the console is nothing more than a keyboard with a cartridge slot and a teeny-tiny joystick that’s inexplicably grafted on to the right side of the keyboard. Such a ludicrous design! Even if you have a small hand that’s proportional to the joystick, I don’t know how you’re supposed to play any SG-1000 game without lying on your stomach or stooping over the keyboard like a hunchback. And God help you if you get mad at a game and want to throw the controller; you either throw the entire console or rage silently to yourself. A second model of the Multivision, the FG-2000, was released in 1984 with a built-in directional pad instead of a joystick and a port that allowed a second actual controller, but by then, the Multivision’s fate on the marketplace had been sealed. Both versions sold poorly, and as a result, are incredibly rare. If anyone has ever owned or played a Multivision, or just see some information that needs fixin’ please leave your thoughts in the comments. The Multivision could play any SG-1000 or SC-3000 game, but it also came bundled with Othello (hence the name) and had a handful of exclusive games packaged under the Multivision branding. Q*bert, Guzzler, and Space Mountain were the three Multivision games that released in 1983, and the last SG-1000-related games I have to cover for that year. I’ll be giving each game a mini-review, and then we propel into the dystopia that is 1984. Looking at this reminds me of the Nintendo’s Family BASIC release that came with a keyboard and allowed you to program your own games onto the Famicom. You couldn’t do anything else with it though, as I recall, so maybe in this particular case Sega trumps Nintendo. Never even heard of this thing….SEEEEEEEEEGA! !